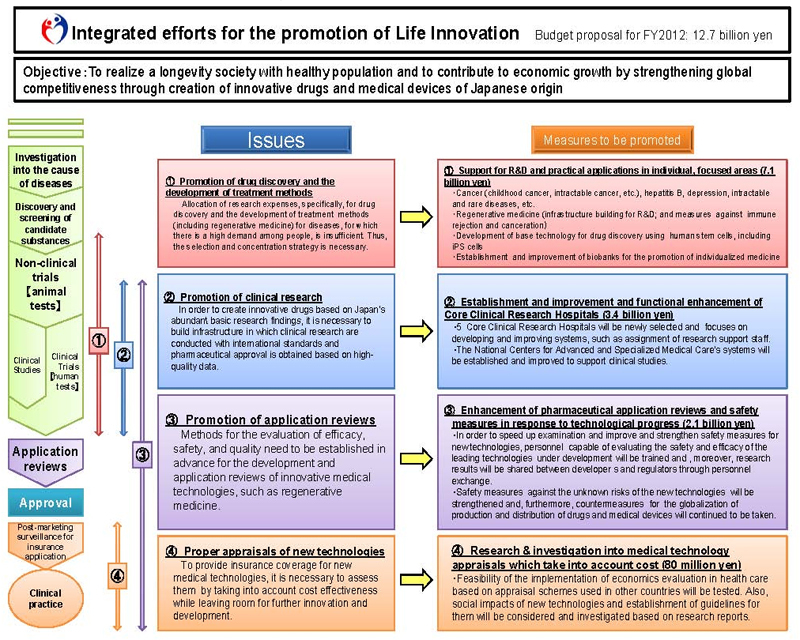 The Ministry of Health, Labour and Welfare has been promoting "Life Innovation" through creation of innovative drugs and medical devices originated in Japan, by giving due consideration to the Government's New Growth Strategy and Comprehensive Reform of Social Security and Tax Systems. The objectives of the "Life Innovation" are to realize a longevity society with healthy population and to contribute to the economic growth by strengthening global competitiveness. One-third of Japanese people die from cancer every year. Hepatitis B also has a low record of treatment and, therefore, there is a strong demand for the development of innovative new drugs for treating such a disease. Furthermore, since securing safety is of utmost importance for regenerative medicine, research is planned to be conducted on transplant rejection. Therefore, the Ministry will intensively devote resources on 6 items, such as cancer, for which there are growing needs. For example, we will support funding the research costs of university hospitals and such. Prior to being commercialized, new drugs need to undergo "clinical trials" and "clinical research," in which they are experimentally used on patients in order to verify their safety and efficacy. However, the investigator-initiated "clinical research" has not been effectively utilized because of the lack of staff, such as Clinical Research Coordinator, in numbers. Therefore, we will make improvements to "Core Clinical Research Hospitals." For instance, we will provide funding for personnel expenses for university hospitals and such. Currently, guidelines, which set out the kinds of tests and results required to decide whether the drugs and medical devices using innovative technology are efficacious and safe, are not available due to the novelty of the technique. If such guidelines are created in parallel with the research development of the new technologies, their development can be made efficient, their review can be accelerated, and their practical applications can be speeded up. Therefore, research projects which assess advanced technologies' efficacy and safety will be implemented, personnel exchanges will be carried out with relevant institutions, and relevant personnel will be trained in universities. Furthermore, universities will serve as the focal point for formulating guidelines, and the acceleration of practical applications of regenerative medicine will be promoted.